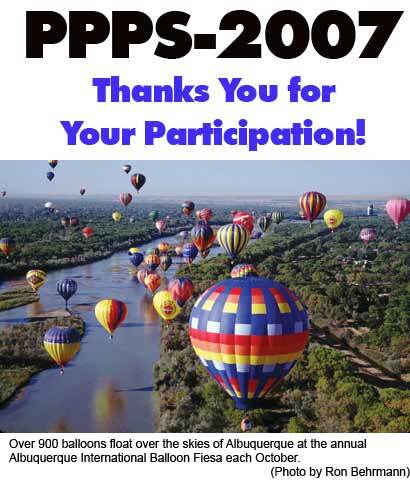 The 34th IEEE International Conference on Plasma Science and the 16th IEEE International Pulsed Power Conference were combined into one conference and was held June 17-22, 2007, at the Albuquerque Convention Center in Albuquerque, New Mexico. The content is password protected and the username/password was e-mailed to conference registrants. Registration will now only be accepted on-site at the conference. Exhibitors: Download the Exhibitor's Form The SOFE 2007 website can be found here. (Banner photo courtesy Ron Behrmann) The University of New Mexico Copyright © 2008 Electrical and Computer Engineering Department Updated:2-28-08/Contact Webmaster.